Greenhouses are continuously increasing in size, with large areas of crops and plants. Today, companies needed to routinely improve the process of their crop protection treatment and plant protection. With the pulsFOG TracFOG, the successful outdoor fogging implementation, we are pleased to announce TracFOG for indoor usage. Our field studies over the past three years of operating the system indoors in Canada and Great Britain, show positive results by applying the ULV method to agricultural businesses. Strawberries are one example of an agricultural business benefiting from our system. By request of many of our valued customers and potential clients, the second part of pulsFOG's field studies includes chrysanthemums. They are presently being tested with positive expectations. In orchard agriculture, such as citrus and avocado orchards, the TracFOG is being currently used for many trials over the next three years. Taking these positive results, the viniculture will be the next aim. The technical development of the TracFOG shows the requested application is the driving force to new innovations. 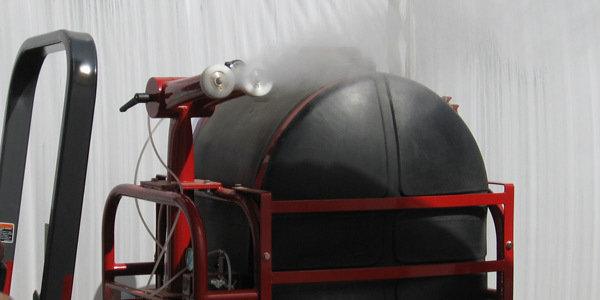 The 12 nozzle system, provides a perfect coverage of orchards (view a movie here). The latest TracFOG demonstration was held in Sicily. If you are interested in attending one of our shows, please contact us!